For all things "possum", see possum (disambiguation). Phalangeriformes is a suborder of any of about 70 small to medium-sized arboreal marsupial species native to Australia, New Guinea, and Sulawesi (and introduced to New Zealand and China). The suborder includes animals commonly known as possums, gliders, and cuscus. The common name "possum" for various Phalangeriformes species derives from the creatures' resemblance to the opossums of the Americas (the term comes from Powhatan language aposoum 'white animal', from Proto-Algonquian *wa·p-aʔɬemwa 'white dog'). However, although opossums are also marsupials, Australasian possums are more closely related to other Australasian marsupials such as kangaroos. Phalangeriformes are quadrupedal diprotodont marsupials with long tails. The smallest species, indeed the smallest diprotodont marsupial, is the Tasmanian pygmy possum, with an adult head-body length of 70 mm (2 3⁄4 in) and a weight of 10 g (3⁄8 oz). The largest are the two species of bear cuscus which may exceed 7 kg (15 lb 7 oz). Phalangeriformes species are typically nocturnal and at least partially arboreal. They inhabit most vegetated habitats, and several species have adjusted well to urban settings. 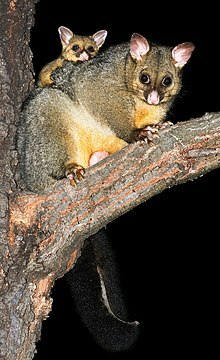 Diets range from generalist herbivores or omnivores (the common brushtail possum) to specialist browsers of eucalyptus (greater glider), insectivores (mountain pygmy possum) and nectar-feeders (honey possum). About two-thirds of Australian marsupials belong to the order Diprotodontia, which is split into three suborders: the Vombatiformes (wombats and the koala, four species in total); the large and diverse Phalangeriformes (the possums and gliders) and Macropodiformes (kangaroos, potoroos, wallabies and the musky rat-kangaroo). Note: this classification is based on Ruedas & Morales 2005. ^ "New research estimates there are about 30 million possums in New Zealand". Landcare Research. 9 December 2009. Retrieved 6 April 2011. Ruedas, L.A.; Morales, J.C. (2005). "Evolutionary relationships among genera of Phalangeridae (Metatheria: Diprotodontia) inferred from mitochondrial data". Journal of Mammalogy. 86 (2): 353–365. doi:10.1644/BER-117.1. JSTOR 4094355. Archived from the original on 11 August 2013.